July has been most uneventful except for the hot weather. Temperatures in the Western Catskills reaching and remained in the mid ’90s. Hot weather was with us about 10 days with hardly a sprinkle of rain. The garden was most uneventful except for weeds! Today seems to have a break in the hot weather with temperatures expected in the lower ’80s. While away in Central Jersey, visiting my dad in the hospital on 7/13, my brother and I spotted a falcon on top of the hospital roof in Summit NJ. The hospital is built very strange. While entering at the parking lot level you are immediately on the 5th floor, so looking up I am estimating the roof to be 4 stories or more higher than ground level. 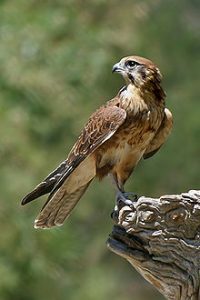 Here this falcon, a magnificent bird, was perched on a roof peak with crows darting at him. I am assuming protecting their young. Falcons were a familiar sighting at our farm in Bayville, NJ. They would streak across the the farm in search of young birds and young squirrels for a meal. 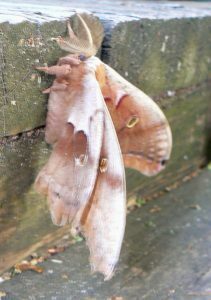 Also while at my staying at my brother’s home, my niece showed me photos of a Polyphemus moths they had found on their deck the previous summer. It was a wonderful looking animal and they were in awe of it. They took the pictures which I post below. 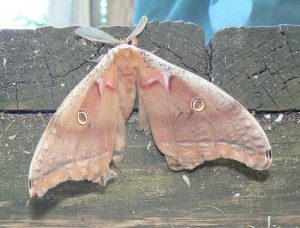 The Polyphemus moth is a North American member of the family Saturniidae, the giant silk moths. 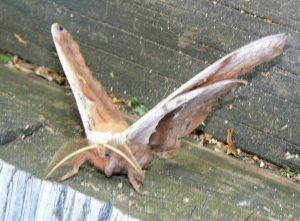 It is a tan colored moth, with an average wingspan of 6 inches. The most notable feature of the moth is its large, purplish eyespots on its two hindwings. The eye spots are where it gets its name from the Greek myth of the Cyclops Polyphemus. The caterpillar of the Polyphemus Moth can eat 86,000 times its weight at emergence in a little less than two months. 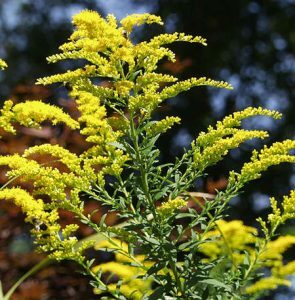 It is widespread throughout much of North America, from southern Canada to parts of Mexico. 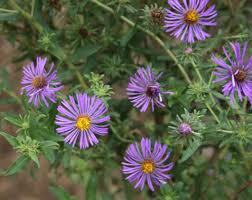 While driving today I noticed that the Goldenrod and Wild Purple Asters are beginning to bloom. I normally see these flowers toward the end of summer! I sure hope this doesn’t mean an early winter. For the past several weeks, we have been seeing these black and white caterpillars all over. I don’t remember seeing them before, or not quite as many. I researched them to be the larvae of the Hickory Tussock moth. Lophocampa caryae, the Hickory Tussock Moth or Hickory Halisidota, is a moth in the family Arctiidae Like most species in its family, the caterpillars acquire chemical defenses from their host plants.The Caterpillars are covered all over in long hairlike setae, in spreading tufts. Most are white, but there are black tufts along the middle of the back, and four long black hair pencils (two near the front, and two near the back). These hairs cause itchy rashes in some people. There are black spots along the sides, and the head capsule is black. Mature caterpillars are found from July to September.